Pixar has been churning out memorable anthropomorphic characters since 1995’s Toy Story. They’ve brought everything from courageous insects to culinary rats and literal emotions to life. But the studio achieved something special with the two robots at the center of WALL-E. A decade after it was first released, Andrew Stanton’s 2008 film remains the animation genre’s most human love story and a masterpiece of visual and aural storytelling. WALL-E, which hit theaters 10 years ago today on June 27, 2008, is a sci-fi movie about humankind’s laziness, greed, and lack of environmental concern. In Stanton’s futuristic dystopia, set in the year 2805, the humans are the bad guys and the machines save the day. Mankind carelessly destroyed their planet with pollution, built a corporation that controls the economy and government in space, and gave up on saving Earth to turn into slothful slaves. You know, typical kid’s movie stuff. While the last survivors of Earth were once real-life people, as shown by the film’s use of live-action actors like Fred Willard in 700-year-old videos, in the dystopian future mankind has evolved into animated beings. (At least, that’s my theory). In their interstellar home they’re confined to hover chairs, unable to walk due to a loss of bone density, and only experience life through their screens (hey, this sounds familiar). The humans of WALL-E are hardly even human at all; instead, the film’s most human character is a garbage truck on wheels. But WALL-E isn’t just so full of life due to the lack of humanity around him. Stanton’s film turns the last robot on Earth into a lovable hero we can identify with. For the first 40 minutes of this 98-minute film there’s practically no dialogue. Besides a brief expositional voiceover from a digital billboard, and WALL-E and EVE exchanging names, we don’t hear any spoken words until the two robots arrive on the Axiom spaceship to meet Jeff Garlin’s Captain. The first half of the film functions like a silent movie, and it’s easy to see the Charlie Chaplin and Buster Keaton influences. WALL-E is pretty much the robot version of the silent film stars, using his gestures and facial expressions (er, metal camera eye-ball expressions) to showcase his sweet and curious personality. There’s a happy-go-lucky giddiness to the way WALL-E cruises along at work, like he has a cheery spring in his motorized step. When he gets home to unload his newly discovered trash treasure, he carefully examines each item with the loving care and wonderment of a child. WALL-E’s tear drop-shaped eyes are also crucial to how he conveys emotion without words. A slight downwards turn tells us how concerned he feels once EVE goes into sleep mode. Stanton uses slapstick to give his character humorous moments too, in scenes where WALL-E sleepily stumbles around his trailer, needing a solar charge like a cup of coffee, when he playfully chases a red light, or frees a crew of kooky malfunctioning robots. The sound design also makes WALL-E more human. He may not talk, but he uses his own language of emotive beeps, squeaks, whistles and digital purrs to express excitement, sadness, panic, curiosity, affection and fear. He screeches in horror when he accidentally crushes his little cockroach buddy, dreamily coos when EVE says his name for the first time, and jovially chirps the tune of “Put On Your Sunday Clothes” from Hello, Dolly! Stanton proves you don’t need words to tell a moving story or create a relatable character. It’s no wonder WALL-E’s voice is so full of texture and detail; he got it from Oscar-winning sound designer Ben Burtt, the same guy responsible for the iconic sounds of the Star Wars universe. Burtt brought WALL-E to life by creating a library of 2,600 sounds for the little robot. (In comparison, for each Indiana Jones and Star Wars movie he worked on, he made between 700 and 1,000 sounds per movie.) 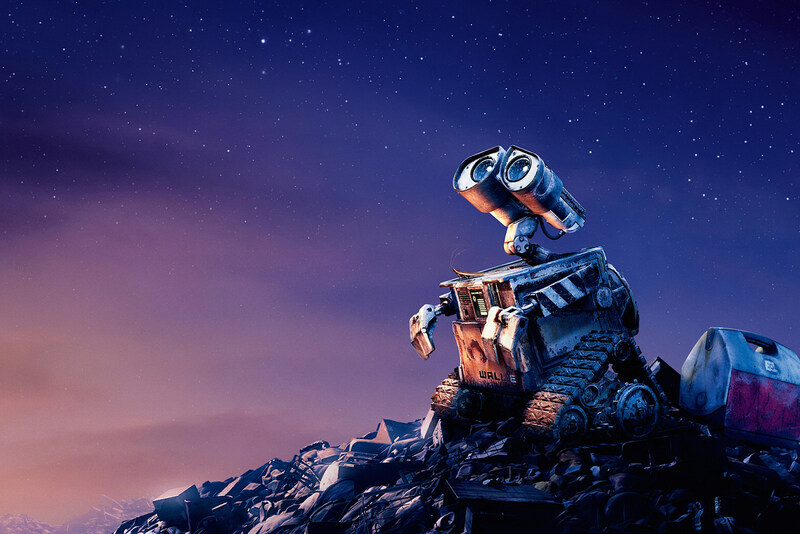 Burtt once described to The Telegraph how WALL-E’s sounds were created and categorized by emotion. “Here are cute sounds, here are angry sounds, here are sounds of him being surprised,” he explained of WALL-E’s auditory library. Burtt did the same for M-O, the adorable clean-freak robot whose nasally beeps wobble with attitude. WALL-E has always been one of my favorite Pixar films, but revisiting it a decade later, I was amazed at how much Burtt’s sound effects still manage to create such emotional performances with animated box-shaped machines. Curious, she begins unspooling the tape. He grabs it back. Protective. Inserts it carefully into the VCR. Please still work. The movie eventually appears on the TV. Plays a clip of POYSC. Mimics the dancing for Eve. She clumsily hops up and down. Makes dents in the floor. Rattles everything. Watching the scene after reading it, I had an even deeper appreciation for how Stanton and his animators translate WALL-E and EVE's relationship to the screen. Technically, it's just a scene where two robots look at a bunch of junk, but watching it is just like watching a lovestruck kid nervously show off his bedroom to his crush for the first time. A script-to-screen video from Pixar shows a side-by-side of the screenplay and finished film. In it, WALL-E and EVE share a kiss and a dance, but the script provides more context for the emotions that inform their noises and shared looks. WALL-E may be a G-rated children's movie, but like the very best of Pixar, it's a prime example of just how poignant animation can be. Sometimes you don't need dialogue, or even a human face to tell a story both kids and adults can appreciate.